They feature two highly flexible Ethernet ports (one with optional PoE) and optional Wireless-LAN for demanding applications in retail, commerce, signage and monitoring applications where cost of ownership is paramount. R2000 supports user uploaded applications, either customer created with the available SDK or pre-written. With many network APNs pre-installed and Robustel's latest easy to use http-web interface, configuration and management are performed quickly and simply. R2000 has Dual-SIM capability with switch-over policy for managed, continuous connectivity. Security features include Firewalls and multiple VPN support, delivering secure dependable connectivity. 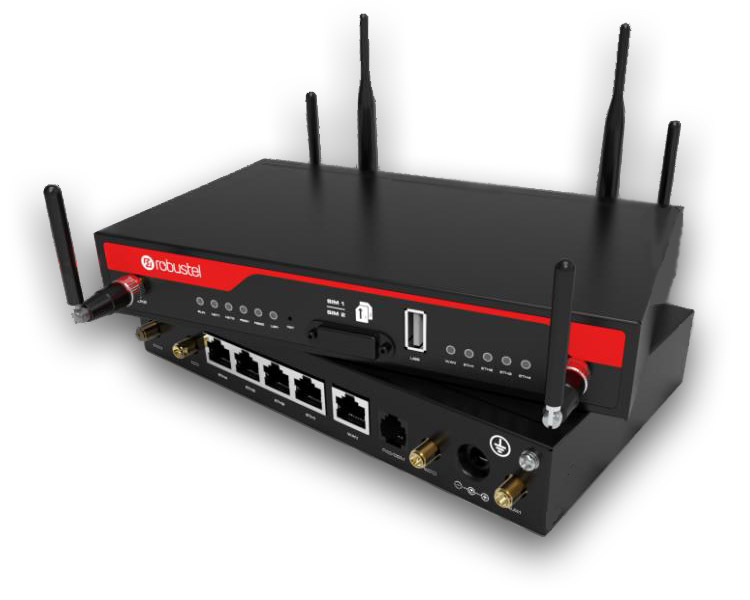 The Robustel GoRugged R2000 Dual range of industrial 4G / 3G Cellular routers deliver highly dependable connectivity for mission-critical applications where a Dual-Radio high performance extendable solution is required. They feature two wireless modules configurable for failover or simultaneously connected operation. Together with four highly flexible Ethernet LAN ports with PoE, an Ethernet WAN port and optional Wireless-LAN, R2000 Dual delivers a flexible configuration for demanding applications where continuous wireless connectivity is paramount. The R2000 Dual offers additional flexibility by supporting user-uploaded applications. Applications can be created by customers using a free SDK or selected from pre-written apps from Robustel, such as 'Wi-Fi Landing page' for the Wi-Fi AP. 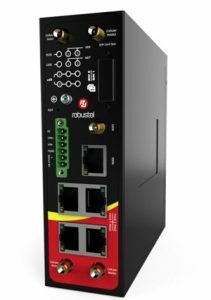 With many network APNs pre-installed and Robustel's latest easy to use http-web interface, configuration and management are performed quickly and simply. 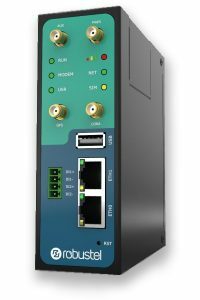 The R2000-Ent is an industrial Cellular VPN Router with Voice and optional single or Dual 4G connectivity. Delivering fast and reliable Internet connectivity & enhanced voice capabilities for enterprise and mission-critical applications. Dual wireless modules are configurable for failover or simultaneously connected operation, supporting next generation SD-WAN topology. Together with four highly flexible Ethernet LAN ports with optional PoE, an Ethernet WAN port and Wireless-LAN, R2000-Ent delivers flexible configuration for demanding applications where continuous connectivity is paramount for multiple devices & voice calls. The R2000-Ent offers additional flexibility by supporting user-uploaded applications created using a free SDK. 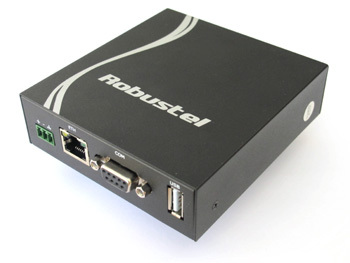 Robustel GoRugged R3000-Lite is a rugged Cellular router offering state-of-the-art mobile connectivity for machine to machine (M2M) applications. The R3000 includes both Ethernet LAN and flexible Serial interface (RS232 / RS485 including Modbus support). 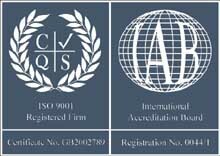 With a clear, easy to use http-web user interface, configuration and management are performed quickly and simply. Furthermore, secure over-the-air access and RobustLink cloud support further extend management and monitoring options for your complete fleet of devices. R3000-Lite includes Dual-SIM capability with switch-over policy for managed, continuous connectivity. Security features include Firewalls and multiple VPN support, delivering secure dependable connectivity for M2M, Metering and Telemetry & POS applications. 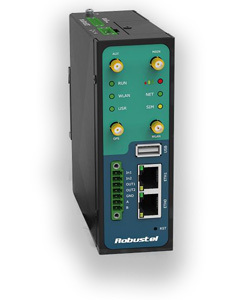 Power Supply: Input voltage range 6.0 to 26 V D.C.
Robustel GoRugged R3000 is a rugged cellular router offering state-of-the-art mobile connectivity for machine to machine (M2M) applications. 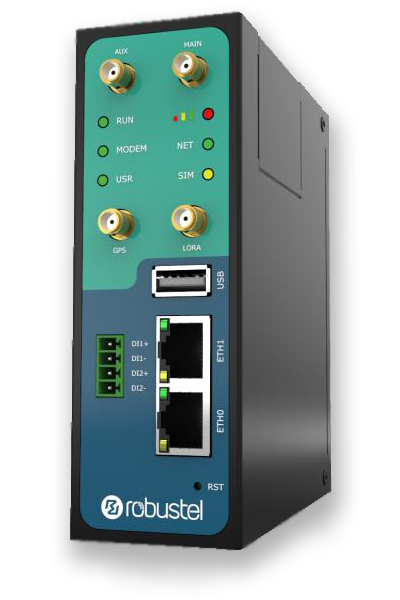 The R3000 has two independent Ethernet LAN connectors configurable as LAN, WAN or WAN with fail-over to Cellular. Configuration and management are simple with the latest web interface, accessible over the air. Furthermore RobustLink cloud-based services can monitor, configurable and forward alerts for your whole fleet of devices. Optional Wi-Fi operates as a WAN client or AP, optional GPS provides accurate time and location for host equipment and cloud-based services. R3000 also features Dual-SIM for continuous cellular connections, multiple VPN support, GPIOs and many other configurable features. With Vodafone approval, AT&T and other network certifications R3000 delivers secure dependable connectivity for world-wide applications. 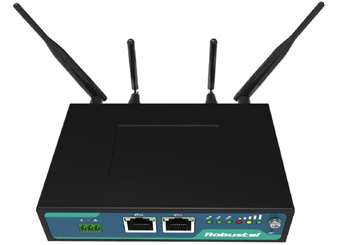 Robustel GoRugged R3000 Quad is a versatile, easy-to-deploy, rugged and reliable VPN gateway designed for harsh environment, providing seamless, secure, fast wireless connectivity to M2M/IoT applications. 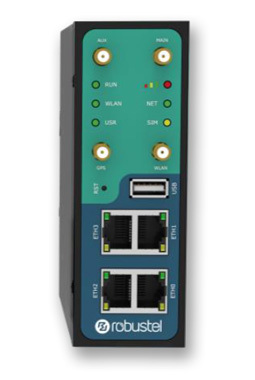 The R3000-Quad has four two independent Ethernet LAN connectors configurable as LAN, WAN or WAN with fail-over to Cellular. Configuration and management are simple with the latest web interface, accessible over the air and via RobustLink cloud-based services which can monitor, configurable and forward alerts for your whole fleet of devices. Optional Wi-Fi operates as a WAN client or AP, optional GPS provides accurate time and location for host equipment and cloud-based services. R3000-Quad features Dual-SIM for continuous cellular connections, multiple VPN support, GPIOs and many other configurable features. Robustel GoRugged R3000-LG is a rugged cellular router with integrated LoRaWAN wireless communications technology. With state-of-the-art mobile wireless, and two independent Ethernet LAN connectors configurable as LAN, WAN or WAN with fail-over to Cellular, the device provides access for various types of LoRa application nodes to the cloud platform. This powerful Gateway device used Robust-OS, a Linux-based operating system for configuration and management via a clean and simple web interface, accessible over the air. Robust-OS offers an SDK for users to develop and run custom applications using C, Python or Java on the device. R3000-LG features Dual-SIM for continuous cellular connectivity, support for RobustLink cloud-based services, multiple VPNs, digital inputs and many other configurable features, with optional GPS to provide accurate time and location for host equipment.